The previous article talked about how businesses can use their resources to "Pull" kids through school. Bradley Troast, our Northwestern University PIP Fellow wrote this article, showing how ContextMedia, donated and installed a beautiful 32" flat-screen television at Cabrini Connections, to enhance our communications to our students and volunteers. This is an example of how a company can use its own technology to help a non profit. Watch for future articles showing how we continue to work with this company. This is a graphic I use often in this blog, and in the Theory of Change page on the Cabrini Connections web site. It conveys a lot of information, but I'm not sure how many people can really look at this, and understand what messages it is communicating. When I'm able to sit with someone and explain this concept it might make more sense (I hope) but I am not able to meet with all of the people in Chicago or around the country who need to understand and embrace this concept in their own strategic uses of time, talent and dollars. Thus, I'm constantly looking for people to help me communicate these ideas in different ways. Below is a screen shot from a new flash animated created by Jawon Koo, an intern from IIT who has been at Cabrini Connections since late January. You can play this here. In the photos and blogs on the Cabrini Connections web site, and on those of other tutor/mentor programs in Chicago, you can see volunteers connecting with youth. In some cases they are working with art, technology, or video. Thus the volunteers are transferring work skills to the kids. They are also expanding the network of people who will help the kids reach life goals. The volunteers are also expanding their own networks at the same time. Thus, if a business encourages volunteer involvement in a tutor/mentor program, as part of their own workforce development strategies, they help pull kids from first grade to a job, while expanding the skills and networks of their own employees. This "Managing the 21st Century Organization" article illustrates why this is so important. Read more of the articles on this blog, and become a sponsor and partner of the Tutor/Mentor Connection and Cabrini Connections. This is a video created by Cabrini Connections film makers and members Shaquille Strauther, Melissa Young and Ashaunti Roby, who wrote, produced, edited and directed this video to promote their upcoming fundraiser this Saturday 2/27/10 from 4pm-7pm at the Green Heart Shop . 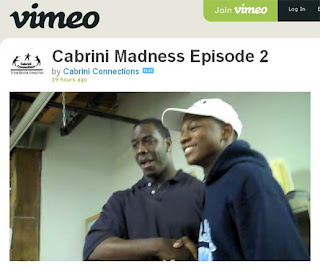 The video not only supports the Cabrini Madness fund raising effort of this team, but also tells of the work being done by the Green Heart Shop ()1911 W. Division St. in Chicago, which is another non profit group that is hosting the fund raising event. This video demonstrates that workplace volunteers, working with inner city kids, can teach skills that they youth apply in their own service to others. These are skills that can lead these teens to part time jobs as they go through high school, and into jobs and careers. However, without the investment of donor dollars, programs like Cabrini Connections can not make such extra learning available for these teens. I hope you'll help by attending the fund raiser Saturday, or by supporting The Awesomes in the Cabrini Madness campaign. 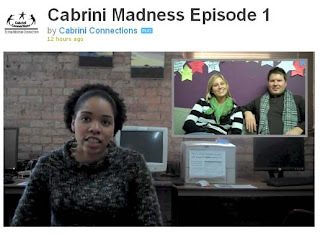 Watch this Cabrini Madness video, showing how teens, volunteers and staff make fund raising FUN. Be a Fan! Be a Booster! Pick a team and support it with your donation. I'm trying to figure out how to use a PhotoStudio Darkroom program to copy slides to my computer and convert them to JPG images. This picture was taken while I served in the Army in Korea in 1970. This next photo was taken at the Korean National Military Cemetery in Seoul. I think it captures a since of peace, and honor, for those who have given their lives for their country. I've got a lot to learn to convert these pictures the way I need to, with the right lighting. I'm also trying to figure a way to crop, using this program. Income-based gap proves hard to close shows that since 2002 the achievement gap has actually grown wider between low-income students and higher income students in Illinois. Lesson from the street: Don’t back down is the second story. Unfortunately, other than being in the same paper, I don't see an effort to link the two stories. As you're looking for solutions, and ways Tribune readers can get involved, I encourage you to read stories I've written in the past about strategy, leadership, violence, media, etc. The tags on the side of my site, are like chapters in a text book. Follow the links in these articles and you'll be more informed, and hopefully find more ways to be involved. This video from Breakthrough Urban Ministries does a wonderful job of showing how a tutor/mentor program builds a network of support for inner city kids. Show it to people you work with, and encourage them to be volunteers and donors to help programs like this grow in all poverty areas. Give us this day our daily ... attention! As a non profit leader I need to find ways to reach more people every day, with ideas that motivate them to support my organization with time, talent and dollars. However, my cause is not the only social issue on the minds of potential volunteers and donors. Everyone has many issues, ranging from family, job, health, politics, etc. that they are concerned about. Thus, we need to constantly innovate ways to draw attention to all tutor/mentor programs, as a way to draw attention and resources to our Cabrini Connections program. If you read some of the 500 or so articles I've posted on this blog, you'll see that they almost all focus on this challenge. Since my organization is smaller than a five-man basketball team, my job is to recruit volunteers and other people who will take a role in this huge vision. I have done that consistently for the past 35 years, and I keep looking for new help every day. One source of help are interns who come to me from various colleges, and various countries. Eunsoo Lee and Jawon Koo are college students from Korea who have spent five months at Illinois Institute of Technology, and the past six weeks at Cabrini Connections, Tutor/Mentor Connection. I asked them to try to convert this pdf essay on collaboration into an animated presentation that more people might look at and respond to. This is the result. It's a flash animation. It's in two parts. Eunsoo Lee did the first part and Jawon Koo did the second part, which you can see here. I hope you'll look at these, and share them with people where you work, worship, socialize, and study. Not only can you implement these ideas, you can even start a student project where you create your own versions of these presentations. As more and more groups work to create new ways to share these ideas, we'll attract a growing number of leaders who help tutor/mentor programs find the dollars, volunteers, technology and other resources needed to connect youth and volunteers and keep them connected for many years. This is a way of giving each of us the daily attention we need in a very cluttered communications environment. Today's Chicago Tribune had an article titled, Nonprofit groups hang by a thread waiting for state funds. In this case the non profit is Youth Crossroads, a Berwyn, Il. group that is included in the Chicago Tutor/Mentor Programs Links Library and has attended Tutor/Mentor Conferences in the past. Below is a map showing where Youth Crossroads is located in the Chicago area. On the Tutor/Mentor Program Locator the green stars represent volunteer-based tutoring and/or mentoring programs. Each one of these groups is struggling to find donors and operating dollars. 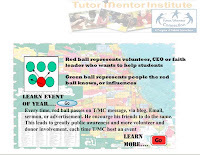 We create these maps, and this blog article, to show how others can point their friends, and philanthropy dollars, at all of the tutor/mentor programs in the Chicago region, on a consistent, year-round basis, so they call all stay in the business of helping young people. Last night I attended a "Speed Dating" Volunteer Recruitment event hosted by Women-OnCall.org. It was intended to introduce busy professional women to volunteer opportunities in non profits. Out of about 70 registered organizations, I was one of 3 or 4 of the 170-plus tutor/mentor programs in Chicago who attended. As I talked to volunteers, my goal was to enlist people who would use T/MC maps, and the ideas on the Tutor/Mentor Institute site, and lead on-going efforts that would help women business professionals take on leader and volunteer roles at ALL of the tutor/mentor programs, not just one or two who were able to successfully recruit a few of the volunteers attending last night's event. I find this a difficult concept to communicate. In every business, leadership and marketing teams work every day to expand the number of customers they have, and the number of stores they have in all parts of the city. I even show this distribution of businesses in the ASSET MAPS on the Program Locator web site. Yet, I find it difficult to find volunteers who can transfer these skills into the non profit sector, and work to build an entire system of well-organized, volunteer-based tutor/mentor programs reaching kids in all poverty neighborhoods of the city. Most of the articles I've written for the past 5 years focus on this strategy. I know people in different parts of the world are reading some of these. I was contacted by someone from the United Way in Detroit this week who said he's been following my blogs for many years. One way I've been trying to help more people understand these ideas is to convert them into animated presentations. This link goes to a new presentation that's going live this week. It illustrates the year-round strategy of the T/MC and the role individuals and organizations can take to help programs like Youth Crossroads have the operating resources they need on a continuous basis. If you'd like to volunteer your time, talent, even dollars to help the Tutor/Mentor Connection communicate these ideas, or to lead efforts that distribute volunteers from your industry into every tutor/mentor program in the City of Chicago, or in your own community, join me on our Ning site, or call 312-492-9614 to discuss ways we can help you get involved. Mentoring Partnerships in other states have annual conferences which are generously supported by big companies and foundations. How do we get that type of support for the Tutor/Mentor Connection and the Leadership and Networking Conference that we host in May and November? That's what Nicole White of the T/MC is writing about today. Think of all the ways volunteers, interns, students and friends of a tutor/mentor program can connect, learn from each other, and take on leadership roles that encourage other people to get involved. This video was created last week by Bradley Troast, a Northwestern University Public Interest Program Fellow, working with Cabrini Connections from July 2009 through June 2010. The announcer is E. Wilson, an intern from Loyola. The two people being interviewed are volunteers at Cabrini Connections. They are part of Team Impeccable, one of 13 teams of students, volunteers, board members and friends who are part of Cabrini Madness 2010. Each team is trying to raise money to keep Cabrini Connections, Tutor/Mentor Connection in business. They are competing with each other to see who can raise the most by April 1, 2010. You can follow the progress of each team at our Cabrini Madness page. You can adopt a team by making a donation, then encourage other people to get involved, just by passing on this blog address, or links to the weekly videos that will be produced. This is a team building activities, a leadership development activity, and a service-learning activity for our teens and volunteers. It's just one of many learning and network-building experiences that happen each week in a program like Cabrini Connections. 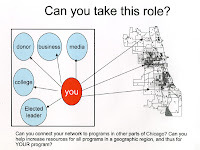 If you look at the Tutor/Mentor Connection strategy map, you'll see that our goal is to help programs like this be operating in all high poverty areas of the Chicago region. It's February. It's time to start thinking of the type of tutor/mentor programs that will be available in Chicago and other cities in the 2010-11 school year. With resources scarce, it's time for volunteer-based organizations to be thinking of how they convert current tutors/mentors into leaders and capacity builders. My thinking on this is expressed in articles like this. "WSM estimates there are more than 240,00 children in Washington State who could benefit from having a mentor and only 30,000 who have one. This leaves a gap of more than 200,000. With your help, we can close that gap. The challenge is not simply a matter of recruiting more mentors. Low capacity to meet demand and inconsistent quality of service are among the most persistent challenges facing the mentoring field. We need to ensure that all programs have the resources they need to meet the demand for their services." This quote is from the Washington State Mentors web site. It could just as easily been referring to Chicago. "At every step of schooling, the tendency is to breath a sigh of relief when a youngster moves on to the next grade. Concern for specific individuals creeps in when learning, behavior, and emotional problems interfere with progress. Public Health concerns arise when large numbers of youngsters are reported as not doing well. Civil rights concerns spring forth when large scale disparities become evident. And economic concerns spring forth with enhanced visibility about the costs to society of so many students dropping out before high school graduation and the impact on global competitiveness of too few students going on to and succeeding in post secondary education. Reducing dropouts, increasing graduation rates, and closing the achievement gap require more than improving preK-12 instruction, enhancing school management and increasing the school's role in providing health and social services." From the front page of the Winter 2010 newsletter from the UCLA Center for Mental Health in Schools. "Child poverty in the U.S. costs at least $500 billion per year, the equivalent of four percent of GDP." "If poverty has an associated cost, then the reduction of poverty should generate an economic return. This return would be realized both for individuals in forms of increased earnings as well as for the entire province in the form of reduced social expenditures and higher tax revenues." Quotes from THE COST of POVERTY: An Analysis of the Economic Cost of Poverty in Ontario, Canada. Don't these ideas apply to Chicago and Illinois just as much as they apply to California and Canada? 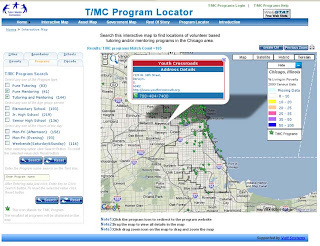 Now how are leaders using this information, and their own marketing and communications resources, and personal networking, to educate more people and mobilize more resources so that business mentors can connect with inner city youth in volunteer-based programs like Cabrini Connections or those shown on this Chicago Program Locator map? Here's a new video showing one way we're encouraging our volunteers to become leaders. As they reach out to invite friends and co-workers to support Cabrini Connections, we hope they will use the ideas in this blog to educate those potential supporters so they go beyond a "random act of kindness and generosity" to becoming strategic supporters of mentoring kids to careers. This photo was taken more than 30 years ago. Yet it still symbolizes what Cabrini Connections, and volunteer-based tutoring/mentoring, is all about. These are two kids who were part of the Montgomery Ward/Cabrini Green Tutoring Program which I joined in 1973. I became its leader in 1975. I was the primary photographer for the next 20 years. What's great about this photo is that is shows the "love" that was represented in this program, and can still be found in Cabrini Connections. It's love that connects kids living in poverty with adults who don't live in poverty. If we're going to close the economic and social gaps in this country, there needs to be more connections like this. However, this picture stands for more. 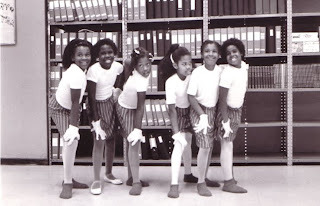 It is one of many that we've posted on a new Cabrini Connections Alumni web site, where we are re-connecting many of the alumni that we've met on Facebook, with each other, and many of our former volunteers. In this web site the write says "It's all about your network". Kids in poverty don't have the same network to open doors for them that is available to kids in more affluent areas. This problem continues into adult lives. Thus, if Cabrini Connections can create a web hub connecting people across forty years of tutoring/mentoring, we can create a network that can help people with the challenges of adult lives. If you believe in this, why not become a sponsor and donor to help us continue to build and maintain these connections. Ending poverty easy. Just end private schools. Imagine if wealthy kids, the children of political leaders and diplomats, and those of high paid executives all had to attend the same schools that inner city kids attend. This blog article by Michelle Rhee is Chancellor of the District of Columbia Public Schools, offers this and many other challenges, saying "The obstacle is not one of knowledge but of social and political will, with education as the lynchpin." What I don't see in this article is a vision, or a strategy, for increasing the number of people who don't live in poverty who will read articles like this, then become part of the "team of adults who decided it was possible for lives and outcomes to move in other direction"
In her article, Rhee is referring to people in schools who make a commitment to do something different. I'm referring to the people beyond schools who become tutors/mentors, business partners, donors, and make a network of non-school supports available in inner city neighborhoods. Such a network of programs can expand the number of adults who become personally engaged, and who begin to see poverty through the eyes of the kids they mentor. When these people begin to get involved, in large enough numbers, we'll expand the number of people who are reading and responding to blogs written by Rhees and others. Tonight about 130 million people will watch the Super Bowl. 30 second TV ads will cost over $2 million each. Today in the Chicago Tribune I read about crooked politicians and how they reap millions in state contracts, and control who gets elected in Illinois and other states. Next week millions will tune into watch the Winter Olympics. While all this may make us feel better, and feed the economy, and make the rich richer, my goal is that by posting messages with these topics in them today and next week, I can attract donors to Cabrini Madness, our own competition to raise needed dollars to fund the work of Cabrini Connections and the Tutor/Mentor Connection. What this illustrates is that "connecting a youth and volunteer in a tutor/mentor program is only the beginning. Keeping them connected to each other, and the program, is an on-going process" that must be continuously funded if the youth will experience the real benefit of an expanded social network consisting of people who don't live in poverty, and who hold jobs in many different industries, when they are adults. This PDF essay illustrates this concept. I don't have the dollars to have an on TV today, or any day of the year. However, if you find this article via a Google Search, Twitter, or Facebook, please choose a Cabrini Madness team to support and make a donation, then pass the message on to your own friends, so they can help too. Does Obama Believe in School Integration? I encourage you to read the material and join this discussion at Fireside Learning's community portal. What should the goals of public education be? Another discussion worth following on Fireside Learning. The reason I feel volunteer-based tutoring/mentoring programs are important is that I grew up in a small Illinois town with just a few minorities. I attended a college with just a few minorities. Most of the people making policy decisions are not people who grew up in high poverty, segregated big city neighborhoods. The only way I became interested in this topic was through my many years of personal involvement with the kids and families of Cabrini Green and inner city Chicago. If we want to change public policy we need to find ways to get more people who don't live in poverty, personally involved so they spend more time trying to understand problems and solutions. I can't believe I've not posted anything this week. I've not been on vacation. What I have been doing is create some new images to help illustrate our goals, work with interns to help them communicate our messages, and reach out through our networks to find donors to fund my organization, as well as all other tutor/mentor programs in the city. Let me give you a brief tour. I hope you'll follow the links I'm pointing to. First, a reminder of why we do what we do. This is not headline from this week's Chicago Tribune. It is from 1994. Not much has changes since then to help city kids because few people are following a master plan, that would put programs and resources in city neighborhoods with the highest poverty, that could influence what happens in non-school hours to influence how kids move through school and into jobs. This is one of many graphics I use to show that I believe the companies that are looking for workers and customers should be providing the leadership, and research, that engages more people from their industries in birth to work strategies that reach kids in schools, and in non school programs. This is a graphic I've posted on this blog many times in the past. It illustrates the role of individuals, and organizations, who can mobilize people to be volunteers and donors in programs all over the Chicago region, not just in one or two well-known locations. The next graphic is the first slide in an animated project being created by Jawon Koo, and intern from IIT and Korea, who is working with T/MC. This is a flash animation, with a recorded narration. Jawon did not know how to create one of these three weeks ago. Thus, he first had to learn about flash, then figure out how to interpret the idea, then find a way to write a script and record it. You can see follow his work on our ning page. The next graphic is a another project being developed by our second IIT intern, Eunson Lee. He also had to learn flash in order to create this project. Follow his work here. Jawon and Eunson are just two new interns working with us. We have four interns from Loyola University. Follow Jordan, E Wilson, Emily, and Jonathon as they help communicate the ideas we're developing. While I work to create an infrastructure that would help every tutor/mentor program in the Chicago region get the consistent resources each needs to grow from Good to Great, I also continue to support that process at Cabrini Connections. We launched a Cabrini Madness fund raising competition this week, and already donors are responding to appeals from teams of students, volunteers, friends and staff. The logo shown here was created by student in our Technology Club, who have been creating graphics for each of our events since last November.